The What: VidOvation today announced the launch of the VidOvation Sports Bundle, a turnkey live mobile-production offering paired with the popular TriCaster® TC1 multicamera production system from NewTek. In the new Sports Bundle offering, VidOvation's AVIWEST bonded cellular system and VidOlink Reacher wireless camera links integrate with TriCaster TC1, enabling customers to broadcast or stream live sports and events from anywhere while eliminating the clutter of camera cabling. 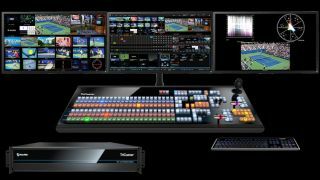 The Why: "The new Sports Bundle combines the magic of bonded cellular with the NewTek TriCaster TC1 for the most flexible and cost-effective events coverage possible. Our collaboration with NewTek allows us to offer the highly regarded TriCaster TC1 system, now equipped with the best wireless technology on the market," said Jim Jachetta, executive vice president and chief technology officer at VidOvation. "As a result, our customers can bring feeds into the TriCaster TC1 wirelessly and broadcast content out of the venue wirelessly, as well. This new offering allows users to capture the action anywhere, then produce and deliver a world-class fan experience at a price that leaves the competition behind." The What Else: Within the bundled solution, the VidOlink Reacher wireless video transmitter/receiver connects multiple cameras wirelessly to a TriCaster TC1 system in a control room or production truck, enabling broadcast-grade HDMI and HD-SDI video transmission up to 3,000 feet with no cables, latency, or compression. Then, when operating in a mobile environment, VidOvation's AVIWEST PRO180-RA bonded cellular and IP link can stream live-event coverage from the TriCaster system to the cloud, Facebook Live, YouTube, UStream, or any master control in the world using a combination of cellular and IP networks. The Bonus: "We're delighted to collaborate with VidOvation on its Sports Bundle, which adds a new dimension to NewTek's end-to-end IP video production workflow," said Brian Olson, vice president of product management for NewTek. "Removing the wires brings a new level of freedom and storytelling to production that is very much in sync with NewTek's philosophy of user empowerment and cutting-edge technology. With VidOvation, not only are the camera links wireless, but so is the option for final delivery. That opens up even more possibilities for our shared customers."